So it seems like everyone has finally woken up to Amazon’s tests of Globalstar’s TLPS service that I wrote about in early July. Presumably “people with knowledge of the matter” are talking to the press now because Globalstar is trying to get an NPRM issued by interim FCC Chairman Clyburn, before she steps down in favor of Tom Wheeler, who may be more likely to opt for lengthier approval process (as I noted last month, he appears to favor using TLPS as the test case for a negotiated “harm claim threshold” approach). Of course the longer that approvals take, the more chance that one or more ecosystems for alternative bands will emerge, and undermine the value of TLPS, so its hardly surprising that Amazon rivals such as Microsoft expressed their “concerns about interference to unlicensed uses in the 2.4GHz band” after Globalstar’s experimental license application gave details of the test locations, and the Bluetooth Special Interest Group has been pushing to delay any NPRM “until a full technical analysis of the impacts has been completed and the impact on the existing users of the ISM spectrum is understood”. Some questions also remain about the compatibility of TLPS with services other than Bluetooth, particularly legacy BAS license holders, which caused the FCC to limit TLPS testing in Silicon Valley to lower power levels and indoor locations only (and has prompted Globalstar to conduct the latest round of testing in New Orleans where there is no legacy BAS usage, although there are some nearby Part 90 public safety users). TV White Space spectrum is one possibility as a substitute for TLPS, but a more direct alternative appears to be the 3550-3650MHz spectrum, especially if the FCC follows the licensing approach proposed by AT&T and Google in a joint letter to the FCC on August 6, urging the Commission to move forward with allocation of the 3550-3650MHz for small cell deployments via a streamlined (i.e. low cost) auction, with any applicant allowed access to a secondary exclusive tier of spectrum if they commit to a “substantial service requirement”. 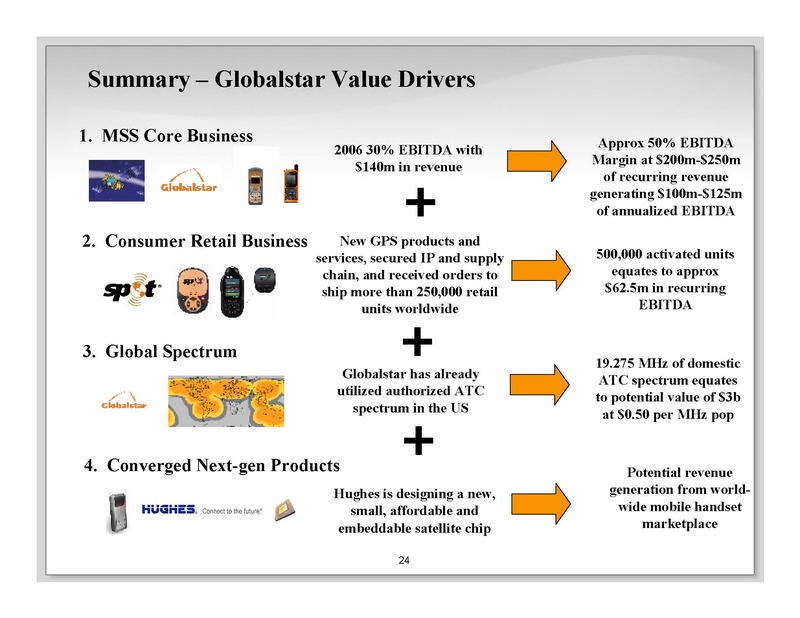 So it is obviously extremely important, if Globalstar is to have any chance of realizing the $3B it has maintained that its spectrum is worth, that approvals are received quickly. However, what Bloomberg’s article didn’t appear to have any clue about, is how Amazon might actually use the spectrum and generate enough value to justify paying Globalstar billions of dollars. In my view, the only realistic plan (as GigaOm notes) is a dedicated WiFi deployment, allowing its own devices (such as Kindles) to use a very extensive small cell network instead of relying on cellular networks for data delivery. To do that Amazon has to get a device into a huge number of homes, and hope that the higher power and longer range of TLPS (compared to unlicensed WiFi) provides widespread coverage in urban areas. The ubiquitous availability of WiFi access points is the theory behind FON, and its notable that in the UK, BT (which has provided FON service through all of its in-home DSL routers for several years) is now switching to licensed 2.5GHz spectrum that it bought in the 4G spectrum auctions earlier this year, in order to provide coverage over a greater distance. So really the most interesting question here is how Amazon intends to get a TLPS access point into millions of homes. It seems highly likely that Amazon is developing a product much like an Xbox, which can serve as a “hub” for gaming and for delivery of its streaming video services (which perhaps explains Microsoft’s concerns about TLPS), connected to existing in-home broadband connections. Remember that Amazon has not been as successful as Netflix in ensuring that access to its streaming video service is widely available on consumer electronics devices like DVD players (probably because it is less willing to pay incentives for acquisition of streaming video subscribers), suggesting that Amazon may well want to push its own device instead. Its important to realize this is not about Amazon providing a rival broadband access service, like DISH’s wants to do with its former satellite spectrum in the AWS-4 band, but instead would compete with Microsoft’s Xbox and the home media hubs planned by Intel, Google and Apple, amongst others. I’d speculate that Amazon will want to provide its “hub” to Prime users pretty cheaply, perhaps even for free, and its notable that Amazon has also been working on remote video processing capabilities using its cloud servers, potentially enabling it to simplify (and reduce the cost of) a gaming device. I’d also guess that Amazon wouldn’t want the launch of this device to be constrained by the timeline of TLPS approvals, not least because the FON-like service is only one part of the entire offering. Indeed its previously been rumored that Amazon is planning to launch a set-top box for video streaming as soon as this fall. However, if TLPS looks likely to gain FCC approval (with the FCC establishing a way forward in the near future), an initial device launch could take place using standard WiFi (and perhaps other solutions like White Space spectrum), with the embedded capability to upgrade to TLPS, once approval comes through. That could mean an upfront option payment for Globalstar (perhaps some tens of millions of dollars? ), if Amazon wants to embed the TLPS capability in its devices, but it may take a while longer before Globalstar finds out if it is going to achieve much more significant returns from its spectrum assets.